Searching for a wedding theme that exudes sophistication? Or a wedding palette that simply can’t go wrong? Either way, a black and white wedding theme is just right to meet your need. Classic and elegant, this is a timeless favorite that couples have perfected time and again. Both the colors, black and white are perfect neutrals. So, there are hundreds of ways in which you can add subtle accents to this combination to personalize your wedding palette. Whether it is a small dose of color or a metallic hue, black and white form the perfect combination to get the details right. Don’t discount the fact that these two colors are easy to find. Choose this combination and you will be saved from hours of tedious swatch matching and combination testing. After all, there is just one black, and maybe not just one, but only a handful of whites to choose from. Life cannot get easier than this, and you will be saved from so much stress when you choose this fail-safe combination. Here, we bring you some interesting and workable ideas to get the various details at your black and white wedding just right. Check it out. 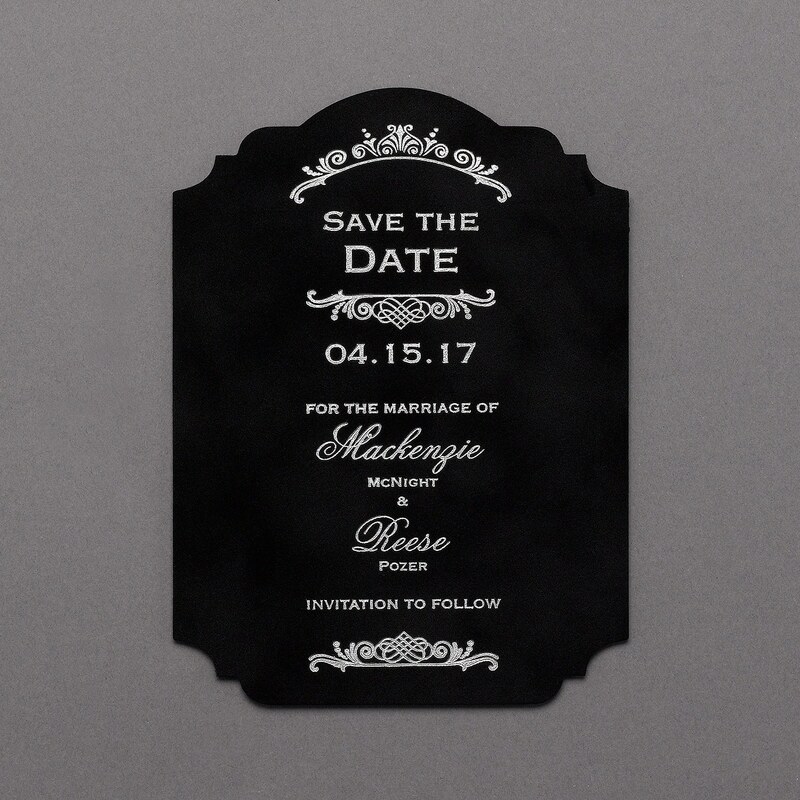 Set the stage for your black and white wedding with this black and white save-the-date card from Best for Bride. The crest shape, velvety finish and foil printing exude an air of glamour and style, and your guests will be intrigued to know what is in store for your wedding day, when the save-the-date card is itself so unusual and interesting. To check it out in detail or to place your order, visit this link here. 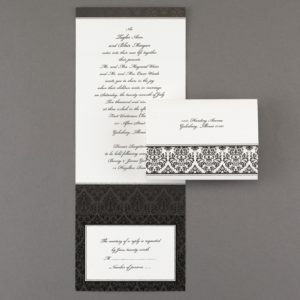 Follow it up with this fantastic damask black and white wedding invitation card and your guests will know they are in for a glamorous evening. This simple seal and send invitation makes work easy for you. Find out more about it by visiting this link here. Here comes the bride! As all eyes are on you during the wedding ceremony, how about a black and white wedding gown to have them saying Wow!? Not only is it perfect for the theme that’s going on, it will also be a classic choice where you do not compromise on style. I don’t think there is any other combination where you can easily find a wedding gown that blends in perfectly with the color palette. And, yes we have the perfect dress to do the job! This Alfred Angelo 2457 is a fantastic black and white wedding gown in a modern fit. The delicately strewn lace details on the bodice extend to the waistline, with a black satin bow with flower detail highlighting the slim waist. Tasteful and striking! The Alfred Angelo 2454 and 2455 are two other black and white wedding gowns in a fit and flare design, that can also be considered for your wedding day. Black flowers aren’t really feasible, or are they? The fail-safe option is to go with the whitest flowers available, and accentuate their stark white color with the rest of the bouquet accessories or foliage. It is a good idea to steer clear of flowers that have a distinct coloring on the inside, as this can water down the effect of the white. White roses and tulips are good candidates to achieve this effect, and the fuller the blooms, the more attractive it will be. 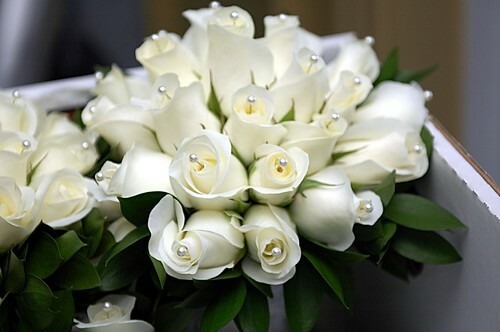 I like the idea of adding little silver pins to the center of the blooms to accentuate the whiteness of this bouquet. 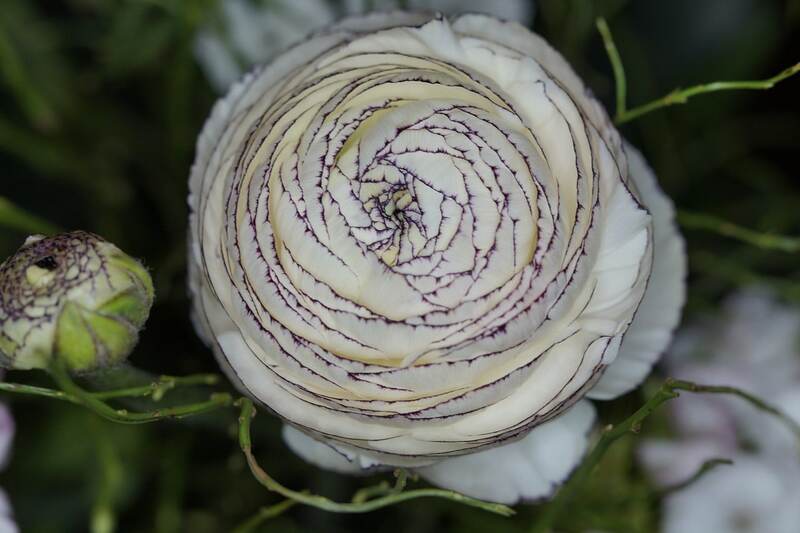 Or if your florist can get hold of this picture-perfect white ranunculus with a black trim, it would be an absolute match for the theme. 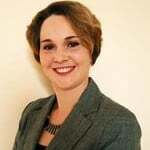 There are several factors that may determine its availability though. 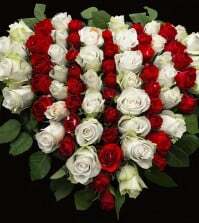 So, its a better idea to have the white rose bouquet as an alternative, if this may not be possible! 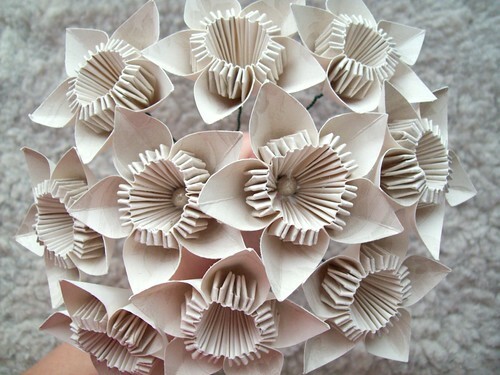 Now, if you are aiming for white that is unblemished and free from any hint of color, paper flowers are your best bet. Look at the mesmerizing beauty of the flowers featured here, isn’t it a work of art? Crafted from paper that is pristine white, the little details in the center make it stunning. Now, if this doesn’t compete with a flower made from real blooms, I don’t know what will. If you want to try your hand at making this bouquet which is not only unique, but beautiful as well, we suggest that you visit Its Always Autumn, which has an extensive list of tutorials to make every type of paper flower imaginable. Make your pick from the bloom that you love and work your way towards DIY-ing your own bridal bouquet. You can also consider using real flowers for your own bouquet, and having paper flower bouquets for your bridesmaids, and save some quick money on your flower budget. 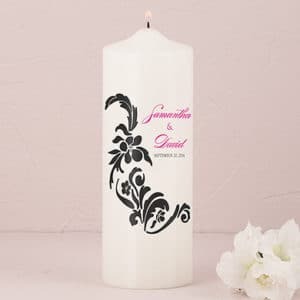 Choose to personalize the unity candle at your wedding ceremony with a beautiful black and white motif that matches the rest of the décor details at your wedding. Here, this candle is embellished with a simple, but attractive damask motif, and the names of the couple are added in an accent color. It can also be a décor item used throughout the venue, if that is what you would prefer. The intricate design and the ideal weaving of the signs of love, such as the love birds and little hearts, make this is a pleasant addition to any wedding. The quickest way to create an impression at your wedding reception is to have a majestically towering black and white wedding cake. The sky is the limit and your baker’s talent the only constraint to weaving magic with flour and sugar to create a black and white wedding dessert. There are several options to work with. You can either use fondant for a sleek and refined finish, or go with white butter cream and simple black cake accessories for a more budget-friendly choice. A simple black satin ribbon around the base of each tier is in itself sufficient to dress up your cake and make it wedding-worthy. 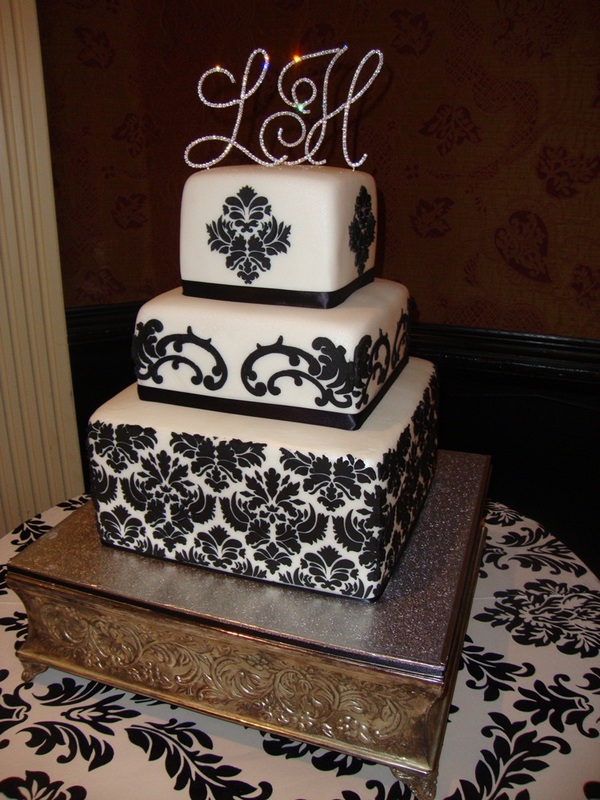 Nevertheless, we favor the elaborate choice of dressing up each clear white tier with beautiful black stencil or lace patterns, as you can see in this cake here. How spectacular is this cake named Damask from Natalya, our wedding vendor at Best for Bride? It is a show stopper and we think you should have one that is just as eye-catching, for your wedding day too. Some things deserve a little extra attention, as it will live on as the memories of your milestone celebration. Your wedding guest book is one of these. Keep the color theme on with a matching black and white damask guest book at your wedding seen here. Simply stylish, with its signature damask print on the upper half and a serene black lower half, this guest book also is embellished with a pretty white grosgrain bow in the center. Your guests will enjoy adding their friendly messages and best wishes to the newly-married couple. The available space can hold almost 700 signatures, and it will be enough and more for your guests to pen their messages to you. It will serve as the perfect memento to remind you of everyone who attended your wedding ceremony and made your big day even more special. Take a closer look at this interesting guest book by clicking on this link here. Spare no attention to detail, and your guests will be amazed with how well you’ve planned your wedding. 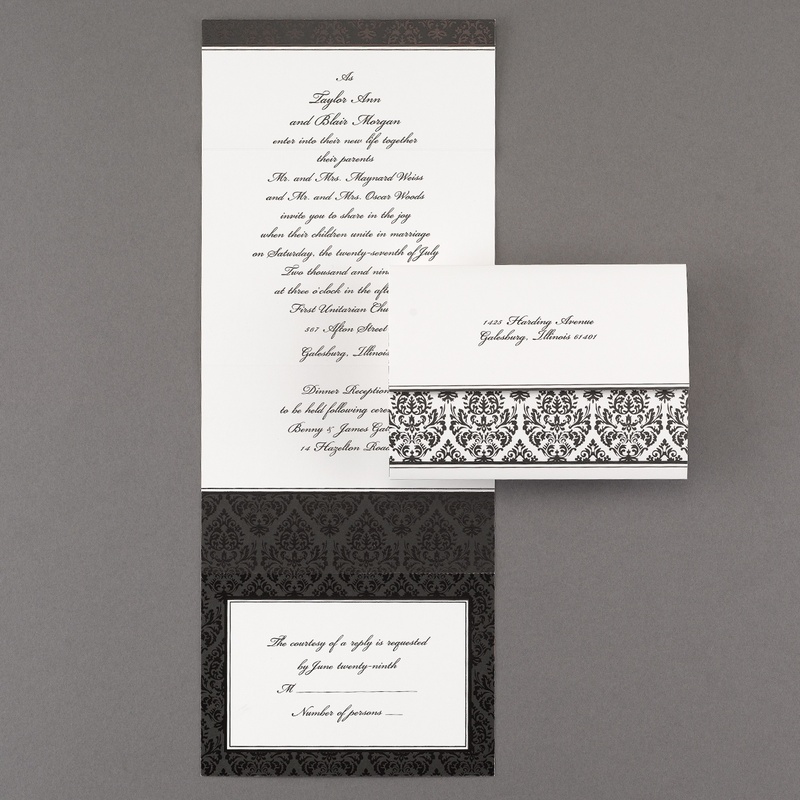 This lacy black and white place card will direct them to their seats in style. The pretty motifs adorning the card are both attractive and artistically done. 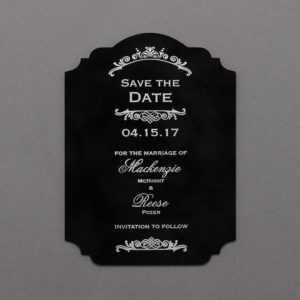 Created with black and fuchsia ink on white card stock, you can custom print it with your guest’s names and the tag line you wish to include. If you want to take a closer look at this beautiful place card, check it out over here. We have many more place cards in the black and white color theme, and you can find all of them at this page. 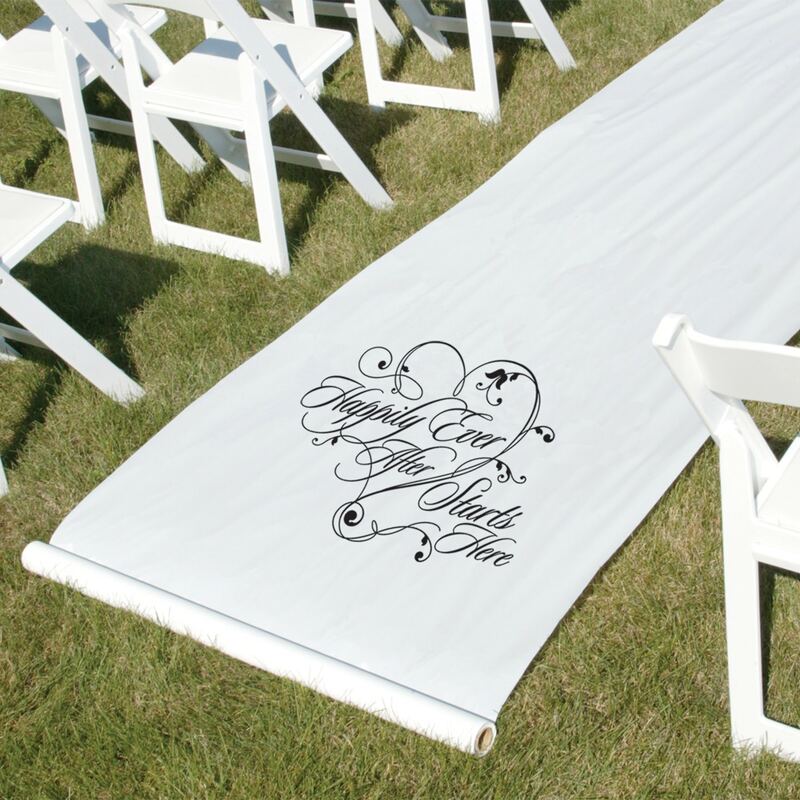 Mark your Happily ever after Union with your life partner from the minute you enter the venue, with this attractive Happily Ever After Black and white Aisle runner. Black calligraphy adorns the white base that you will happily walk down on your wedding day. This aisle runner comes loaded with the pull cord making it both practical and convenient. Whether you have an outdoor or indoor ceremony planned, this will not be out of place, and will add the necessary dose of white to your ceremony venue in an instant. 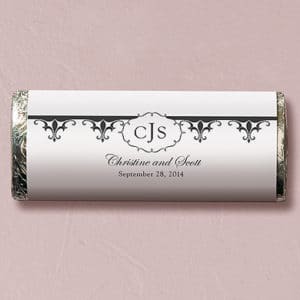 Find out about how you can order this, and also check out the other black and white aisle runner options we offer by visiting this page on Best for Bride. 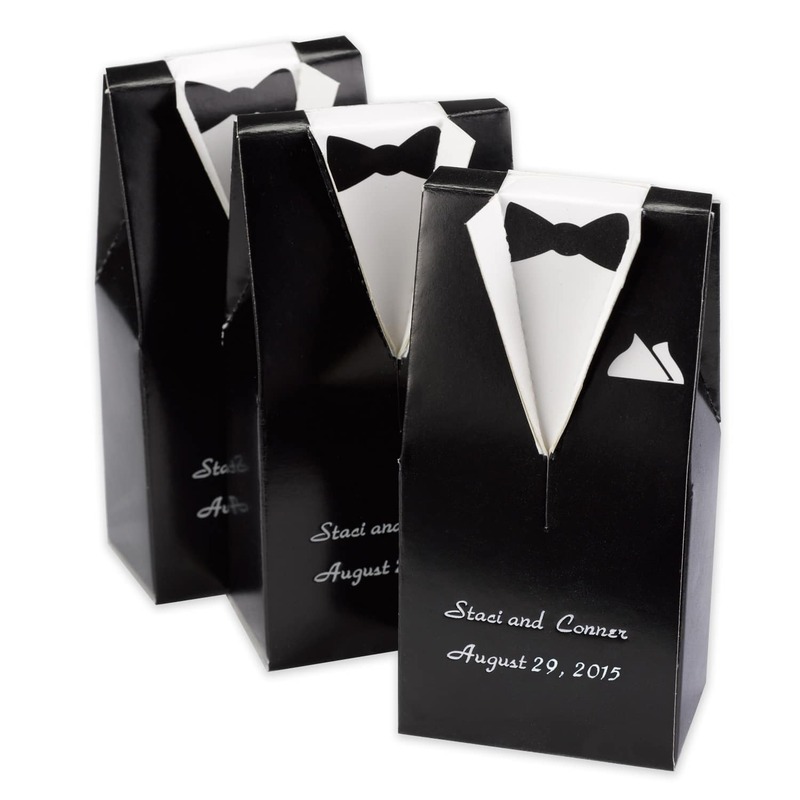 Black and white favor boxes can house any gift and still have you sticking to your wedding color palette. That is what these interesting black and white tuxedo favor boxes can achieve with ease. Ideal for storing a handful of candies or sweets, they make the right choice for a tasty and interesting gift to pack your guests home with. Don’t forget to customize them with a small line that reads your names and the date of your wedding, and it will be ready to be taken away. Or if you prefer to leave it plain and keep it as it is, you can choose to do that too. Either way, we are sure this is a gift that every guest will be dying to open and find out what is within. Click here on this link to find the pricing and other details regarding this customized wedding favor choice. Reserve your places at your wedding reception in style with a pair of black and white chair backs that mention who the bride and groom are. The easiest option to set up the décor to match the palette is to use chairs that are painted white. Ones similar to those shown in this picture will look beautiful in both indoor and outdoor settings. The shimmery base of the signs are embellished with a flourish of black foil to make it attractive and ideal for the party. This particular design is available at Best for Bride, and you can place your order by clicking this link. Small white and black elements on all the tables at your reception will pack a punch as they add more detail to your wedding color palette. 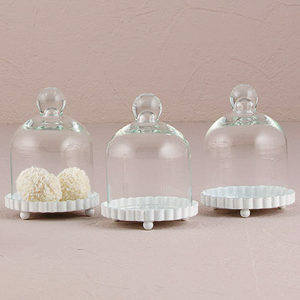 These miniature glass bell jars allow you to customize your table settings with what you choose to display in them. 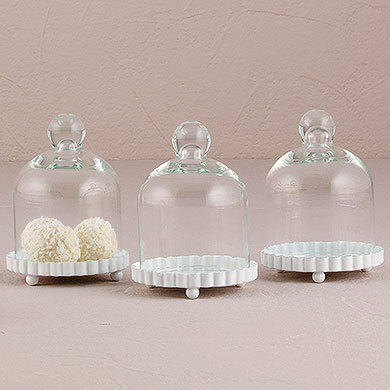 The best thing about this is that it can also double up as wedding favors which your guests will find useful in their homes, after they enjoy the yummy little treats that you pack into them. Whether you choose to display little cupcakes in pretty black and white filigree cases, stuff it with cookies, or line it up beside a stack of gourmet milk chocolates with a custom black and white wrapper like seen here, it will be a befitting element that adds to your classic décor. 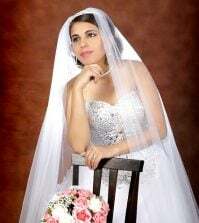 For more wedding décor items, wedding dresses, accessories and cakes for your dramatic black and white wedding, visit our Best for Bride website. There you go. I never really thought about BLACK and white together. Sometimes people think black can be so dark. However, these options put that into a different light! These are perfect and exactly what I needed to see for our planner! Black and white can be a very contrasting situation for accessories and decor, but I am not sure I would like that my dress is included in that. Great ideas, however! These tips are very good for a black/white weddining. Many of the photos taken get converted to black and white anyway, so why not start there? Not really a fan. There is something lost in the black when it comes to elegance for a wedding day.